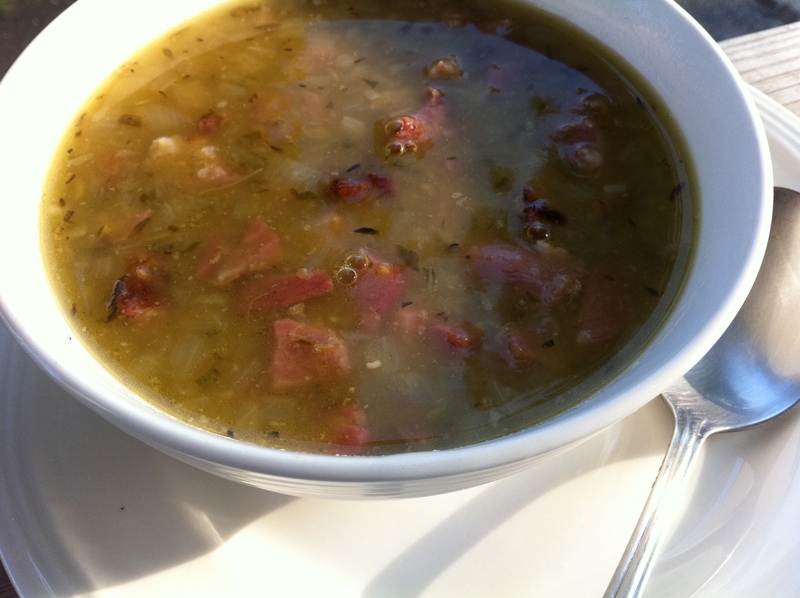 In an effort to recreate a childhood memory, Jathan conjured up this hearty and delicious split pea soup recipe your family will ask for time and again. Growing up in Southern California, one of my fondest memories is going to Pea Soup Andersen’s restaurant on I-5. Kitschy and rustic, the restaurant is world-famous for their signature soup, which my family could never get enough of. Years later, when I wanted to recreate the recipe, I conjured up this tasty version which some have claimed is even better than the original. My family loves the recipe because it is hearty and delicious. I love it because it is yummy on its own, or makes the perfect accompaniment to a grilled cheese sandwich for a tasty lunch any time of year. In a large Dutch oven, sauté onion in oil until tender. Add the remaining ingredients. Bring to a boil, reduce heat. Cover and simmer for 3 hours or until peas are tender and soup has thickened. Discard bay leaves. Remove ham shanks and set aside until cool. Cube meat and return to pot. Stir thoroughly and serve. TIP: Be sure to rinse the split peas and discard any shriveled peas or bits of dirt before they are added to the soup.